The Release Notes include information concerning the release of a new Magic: The Gathering set, as well as a collection of clarifications and rulings involving that set’s cards. It’s intended to make playing with the new cards more fun by clearing up the common misconceptions and confusion inevitably caused by new mechanics and interactions. As future sets are released, updates to the Magic rules may cause some of this information to become outdated. If you can’t find the answer you’re looking for here, please contact us at Wizards.com/CustomerService. The “General Notes” section includes release information and explains the mechanics and concepts in the set. The “Card-Specific Notes” section contains answers to the most important, most common, and most confusing questions players might ask about cards in the set. Items in the “Card-Specific Notes” section include full card text for your reference. Not all cards in the set are listed. The Dragons of Tarkir set contains 264 cards (101 common, 80 uncommon, 53 rare, 15 mythic rare, and 15 basic land). The Dragons of Tarkir set becomes legal for sanctioned Constructed play on its official release date: Friday, March 27, 2015. At that time, the following card sets will be permitted in the Standard format: Theros, Born of the Gods, Journey into Nyx, Magic 2015, Khans of Tarkir, Fate Reforged, and Dragons of Tarkir. 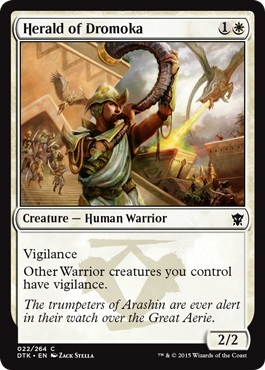 Sarkhan’s journey to the past to save the Spirit Dragon Ugin has changed Tarkir. 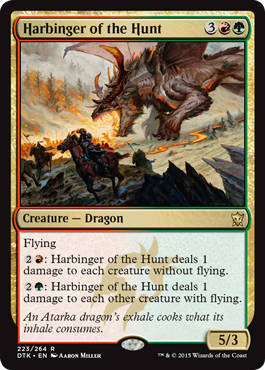 Dragons are everywhere, and Dragons of Tarkir has more Dragons than any set before it. Five clans still rule the landscape, but they are two-color clans each named after and led by a fearsome dragonlord. These present-day clans strongly resemble the clans of Tarkir’s past, as well as those in a present that never was. Each clan has an icon associated with it, appearing on cards strongly associated with that clan, including cards with that clan’s signature ability. These icons have no effect on game play. The Dromoka clan is green and white. To her followers, Dromoka is the ideal draconic embodiment of endurance. 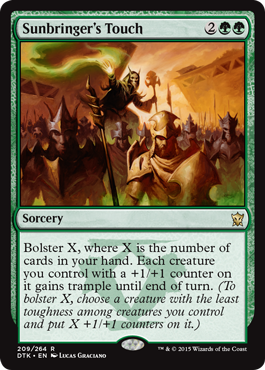 Bolster is a returning keyword action that puts +1/+1 counters on your smallest creature, ensuring there are no weak links in your army. 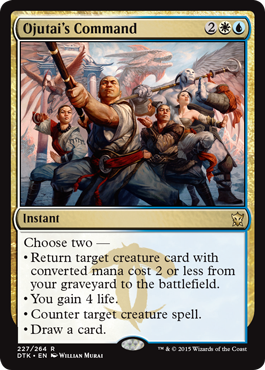 It hasn’t changed since its appearance in the Fate Reforged set. 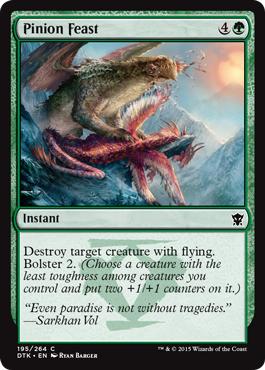 Bolster itself doesn’t target any creature, though some spells and abilities that bolster may have other effects that target creatures. 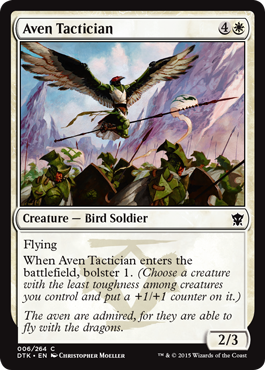 For example, you could put counters on a creature with protection from white with Aven Tactician’s bolster ability. You determine which creature to put counters on as the spell or ability that instructs you to bolster resolves. That could be the creature with the bolster ability, if it’s still under your control and has the least toughness. The Ojutai clan is white and blue. To his followers, Ojutai is the ideal draconic embodiment of cunning. 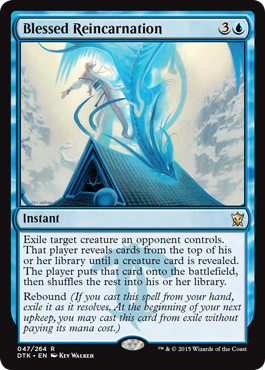 Rebound is a returning keyword found on some instants and sorceries that lets you cast those spells a second time for free at the beginning of your next upkeep. It hasn’t changed since its last appearance in the Rise of the Eldrazi set. Target creature gets +2/+0 until end of turn and can’t be blocked this turn. 702.87b Casting a card without paying its mana cost as the result of a rebound ability follows the rules for paying alternative costs in rules 601.2b and 601.2e–g. Casting the card again due to the delayed triggered ability is optional. If you choose not to cast the card, or if you can’t (perhaps because there are no legal targets available), the card will stay exiled. You won’t get another chance to cast it on a future turn. If a spell with rebound that you cast from your hand is countered for any reason (either because of another spell or ability or because all its targets are illegal as it tries to resolve), that spell won’t resolve and none of its effects will happen, including rebound. The spell will be put into its owner’s graveyard and you won’t get to cast it again on your next turn. At the beginning of your upkeep, all delayed triggered abilities created by rebound effects trigger. You may handle them in any order. If you want to cast a card this way, you do so as part of the resolution of its delayed triggered ability. Timing restrictions based on the card’s type (if it’s a sorcery) are ignored. Other restrictions, such as “Cast [this spell] only during combat,” must be followed. As long as you cast a spell with rebound from your hand, rebound will work regardless of whether you paid its mana cost or an alternative cost you were permitted to pay. 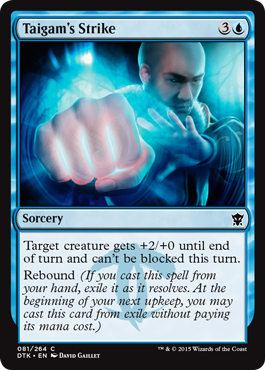 If you cast a spell with rebound from any zone other than your hand (including your opponent’s hand), rebound will have no effect. If a replacement effect (such as the one created by Rest in Peace) would cause a spell with rebound that you cast from your hand to be put somewhere other than into your graveyard as it resolves, you can choose whether to apply the rebound effect or the other effect as the spell resolves. Rebound will have no effect on copies of spells because you don’t cast them from your hand. If you cast a card from exile this way, it will go to its owner’s graveyard when it resolves or is countered. It won’t go back to exile. The Silumgar clan is blue and black. To his followers, Silumgar is the ideal draconic embodiment of ruthlessness. Exploit is a new keyword ability found on creatures. When a creature with exploit enters the battlefield, you may sacrifice a creature. Creatures with exploit have another ability that gives you a benefit for doing so. 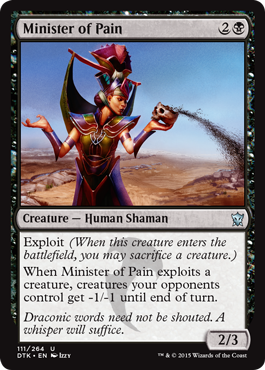 When Minister of Pain exploits a creature, creatures your opponents control get -1/-1 until end of turn. 702.109b A creature with exploit “exploits a creature” when the controller of the exploit ability sacrifices a creature as that ability resolves. The Kolaghan clan is black and red. To her followers, Kolaghan is the ideal draconic embodiment of speed. Dash is a returning keyword that lets you cast creature spells for an alternative cost, giving the creature haste and returning it to its owner’s hand at the end of the turn. 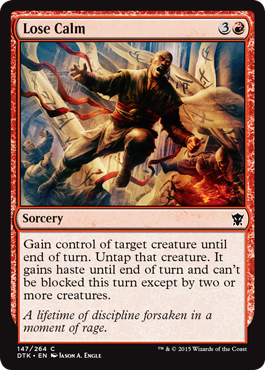 It hasn’t changed since its appearance in the Fate Reforged set. 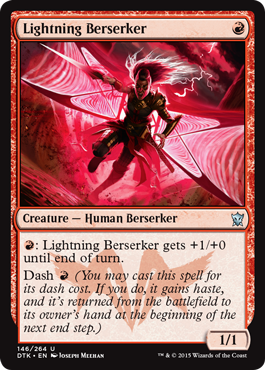 R: Lightning Berserker gets +1/+0 until end of turn. 702.108a Dash represents three abilities: two static abilities that function while the card with dash is on the stack, one of which may create a delayed triggered ability, and a static ability that functions while the object with dash is on the battlefield. 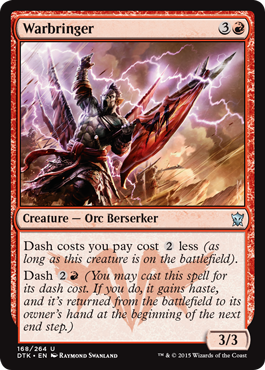 “Dash [cost]” means “You may cast this card by paying [cost] rather than its mana cost,” “If you chose to pay this spell’s dash cost, return the permanent this spell becomes to its owner’s hand at the beginning of the next end step,” and “As long as this permanent’s dash cost was paid, it has haste.” Paying a card’s dash cost follows the rules for paying alternative costs in rules 601.2b and 601.2e–g. If you choose to pay the dash cost rather than the mana cost, you’re still casting the spell. It goes on the stack and can be responded to and countered. You can cast a creature spell for its dash cost only when you otherwise could cast that creature spell. Most of the time, this means during your main phase when the stack is empty. If you pay the dash cost to cast a creature spell, that card will be returned to its owner’s hand only if it’s still on the battlefield when its triggered ability resolves. If it dies or goes to another zone before then, it will stay where it is. You don’t have to attack with the creature with dash unless another ability says you do. If a creature enters the battlefield as a copy of or becomes a copy of a creature whose dash cost was paid, the copy won’t have haste and won’t be returned to its owner’s hand. 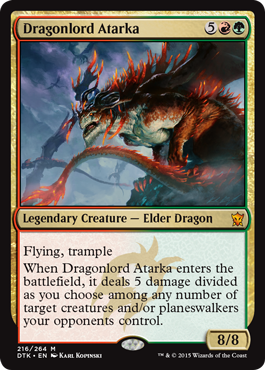 The Atarka clan is red and green. To her followers, Atarka is the ideal draconic embodiment of savagery. Formidable — 4G: Atarka Beastbreaker gets +4/+4 until end of turn. Activate this ability only if creatures you control have total power 8 or greater. 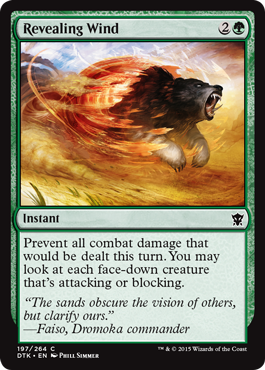 Formidable — Whenever Sabertooth Outrider attacks, if creatures you control have total power 8 or greater, Sabertooth Outrider gains first strike until end of turn. If you control a creature with power less than 0, use its actual power when calculating the total power of creatures you control. For example, if you control three creatures with powers 4, 5, and -2, the total power of creatures you control is 7. Some formidable abilities are activated abilities that require creatures you control to have total power 8 or greater. Once you activate these abilities, it doesn’t matter what happens to the total power of creatures you control. Other formidable abilities are triggered abilities with an “intervening ‘if’” clause. Such abilities check the total power of creatures you control twice: once at the appropriate time to see if the ability will trigger, and again as the ability tries to resolve. If, at that time, the total power of creatures you control is no longer 8 or greater, the ability will have no effect. Magic rooted in deception and concealment is used throughout Tarkir. Megamorph is a new variant of morph that allows creatures to be cast face down, hiding their true identities. 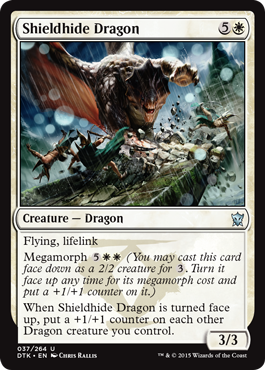 When Shieldhide Dragon is turned face up, put a +1/+1 counter on each other Dragon creature you control. 702.36b To cast a card using its morph ability, turn it face down. It becomes a 2/2 face-down creature card with no text, no name, no subtypes, and no mana cost. Any effects or prohibitions that would apply to casting a card with these characteristics (and not the face-up card’s characteristics) are applied to casting this card. These values are the copiable values of that object’s characteristics. (See rule 613, “Interaction of Continuous Effects,” and rule 706, “Copying Objects.”) Put it onto the stack (as a face-down spell with the same characteristics), and pay 3 rather than pay its mana cost. This follows the rules for paying alternative costs. You can use a morph ability to cast a card from any zone from which you could normally play it. When the spell resolves, it enters the battlefield with the same characteristics the spell had. The morph effect applies to the face-down object wherever it is, and it ends when the permanent is turned face up. 702.36c You can’t cast a card face down if it doesn’t have a morph ability. 702.36d Any time you have priority, you may turn a face-down permanent you control face up. This is a special action; it doesn’t use the stack (see rule 115). To do this, show all players what the permanent’s morph cost would be if it were face up, pay that cost, then turn the permanent face up. (If the permanent wouldn’t have a morph cost if it were face up, it can’t be turned face up this way.) The morph effect on it ends, and it regains its normal characteristics. Any abilities relating to the permanent entering the battlefield don’t trigger when it’s turned face up and don’t have any effect, because the permanent has already entered the battlefield. 702.36e Megamorph is a variant of the morph ability. 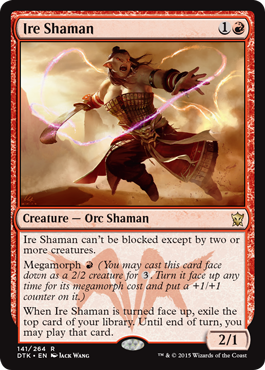 “Megamorph [cost]” means “You may cast this card as a 2/2 face-down creature with no text, no name, no subtypes, and no mana cost by paying 3 rather than paying its mana cost” and “As this permanent is turned face up, put a +1/+1 counter on it if its megamorph cost was paid to turn it face up.” A megamorph cost is a morph cost. 702.36f See rule 707, “Face-Down Spells and Permanents,” for more information on how to cast cards with a morph ability. 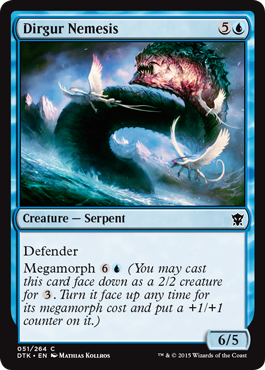 With the exception of putting a +1/+1 counter on the creature as it turns face up, megamorph functions the same way morph does. The following bullet points originally appeared in the Khans of Tarkir Release Notes for the morph ability and apply to megamorph as well. Morph lets you cast a card face down by paying 3, and lets you turn the face-down permanent face up any time you have priority by paying its morph cost. The face-down spell has no mana cost and has a converted mana cost of 0. When you cast a face-down spell, put it on the stack face down so no other player knows what it is, and pay 3. This is an alternative cost. When the spell resolves, it enters the battlefield as a 2/2 creature with no name, mana cost, creature types, or abilities. It’s colorless and has a converted mana cost of 0. Other effects that apply to the creature can still grant it any of these characteristics. Any time you have priority, you may turn the face-down creature face up by revealing what its morph cost is and paying that cost. This is a special action. It doesn’t use the stack and can’t be responded to. Only a face-down permanent can be turned face up this way; a face-down spell cannot. If a face-down creature loses its abilities, it can’t be turned face up by paying its morph cost because it no longer has morph or a morph cost. Because the permanent is on the battlefield both before and after it’s turned face up, turning a permanent face up doesn’t cause any enters-the-battlefield abilities to trigger. Because face-down creatures don’t have a name, they can’t have the same name as any other creature, even another face-down creature. A permanent that turns face up or face down changes characteristics but is otherwise the same permanent. Spells and abilities that were targeting that permanent, as well as Auras and Equipment that were attached to the permanent, aren’t affected. Turning a permanent face up or face down doesn’t change whether that permanent is tapped or untapped. At any time, you can look at a face-down spell or permanent you control. You can’t look at face-down spells or permanents you don’t control unless an effect instructs you to do so. You must ensure that your face-down spells and permanents can easily be differentiated from each other. You’re not allowed to mix up the cards that represent them on the battlefield in order to confuse other players. The order they entered the battlefield should remain clear. Common methods for doing this include using markers or dice, or simply placing them in order on the battlefield. This set includes a cycle of artifacts that can be tapped for one of two colors of mana and can become Dragons. 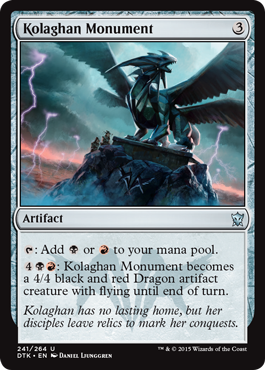 4BR: Kolaghan Monument becomes a 4/4 black and red Dragon artifact creature with flying until end of turn. A Monument can’t attack on the turn it enters the battlefield. Each Monument is colorless, although the last ability will make each of them two colors until end of turn. If a Monument has any +1/+1 counters on it, those counters will remain on the permanent after it stops being a creature. Those counters will have no effect as long as the Monument isn’t a creature, but they will apply again if the Monument later becomes a creature. Activating the last ability of a Monument while it’s already a creature will override any effects that set its power or toughness to a specific value. Effects that modify power or toughness without directly setting them to a specific value will continue to apply. This set includes a cycle of Commands, modal spells that let you choose two of their four modes. You choose the two modes as you cast the spell. You must choose two different modes. Once modes are chosen, they can’t be changed. You can choose a mode only if you can choose legal targets for that mode. Ignore the targeting requirements for modes that aren’t chosen. 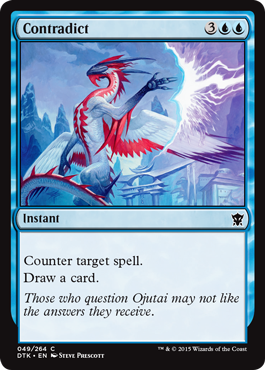 For example, you can cast Ojutai’s Command without targeting a creature spell provided you don’t choose the third mode. If a Command is copied, the effect that creates the copy will usually allow you to choose new targets for the copy, but you can’t choose new modes. If all targets for the chosen modes become illegal before the Command resolves, the spell will be countered and none of its effects will happen. If at least one target is still legal, the spell will resolve but will have no effect on any illegal targets. This set includes several cards that improve if you reveal a Dragon card in your hand as an additional cost to cast them or if you controlled a Dragon as you cast them. As an additional cost to cast Foul-Tongue Invocation, you may reveal a Dragon card from your hand. Target player sacrifices a creature. 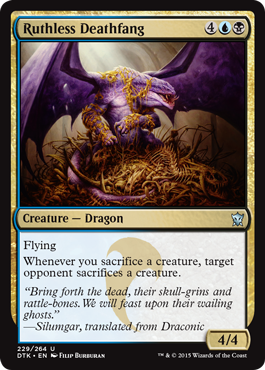 If you revealed a Dragon card or controlled a Dragon as you cast Foul-Tongue Invocation, you gain 4 life. If one of these spells is copied, the controller of the copy will get the “Dragon bonus” only if a Dragon card was revealed as an additional cost. The copy wasn’t cast, so whether you controlled a Dragon won’t matter. You can’t reveal more than one Dragon card to multiply the bonus. There is also no additional benefit for both revealing a Dragon card as an additional cost and controlling a Dragon as you cast the spell. If you don’t reveal a Dragon card from your hand, you must control a Dragon as you are finished casting the spell to get the bonus. For example, if you lose control of your only Dragon while casting the spell (because, for example, you sacrificed it to activate a mana ability), you won’t get the bonus. 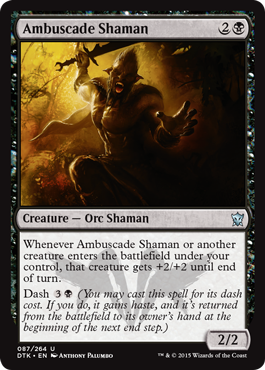 If Ambuscade Shaman enters the battlefield at the same time as other creatures you control, its ability will trigger for each of those creatures. Ancestral Statue’s ability is mandatory. 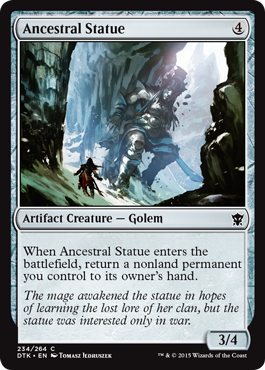 If Ancestral Statue is the only nonland permanent you control when its ability resolves, you must return it to its owner’s hand. The triggered ability doesn’t target any permanent. You choose which one to return as the ability resolves. No player can respond to this choice once the ability starts resolving. 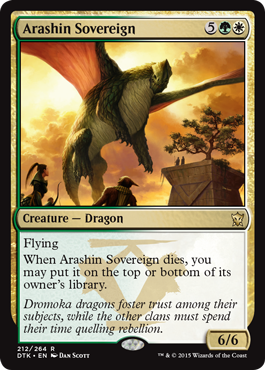 The player who controlled Arashin Sovereign when it died chooses whether to put it on the top or bottom of its owner’s library. The player may also choose to leave Arashin Sovereign in the graveyard. This choice is made as the ability resolves. Arashin Sovereign will be put on the top or bottom of that library only if it’s still in the graveyard when its ability resolves. If it leaves the graveyard before that point, it will stay in whatever zone it’s in, even if it’s returned to the graveyard before the ability resolves. G: Target creature with defender can attack this turn as though it didn’t have defender. For example, a 2/3 creature will assign 3 combat damage rather than 2. The first ability doesn’t actually change any creature’s power. It changes only the value of the combat damage it assigns. All other rules and effects that check power or toughness use the real values. 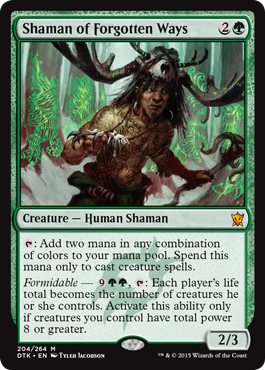 Formidable — 3RR: Each creature you control can’t be blocked this turn except by two or more creatures. Activate this ability only if creatures you control have total power 8 or greater. 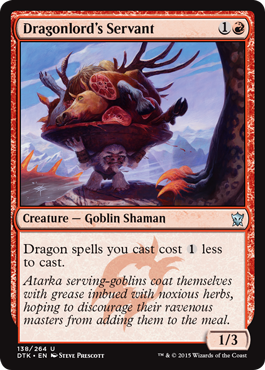 Activating Atarka Pummeler’s ability more than once conveys no additional benefit to creatures you control. Your opponents can’t gain life this turn. Atarka’s Command deals 3 damage to each opponent. Creatures you control get +1/+1 and gain reach until end of turn. The first mode won’t affect life that was gained earlier in the turn. If you choose the third mode and put a land card onto the battlefield, that doesn’t count as playing a land. For example, you can both play a land and put a land onto the battlefield this way during your turn. 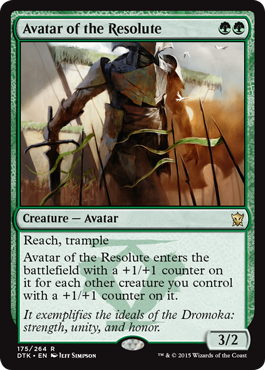 When determining how many +1/+1 counters Avatar of the Resolute enters the battlefield with, don’t count any creatures entering the battlefield at the same time, even if those creatures enter the battlefield with +1/+1 counters on them. Exile target creature an opponent controls. That player reveals cards from the top of his or her library until a creature card is revealed. The player puts that card onto the battlefield, then shuffles the rest into his or her library. If there are no creature cards in the library, it will be revealed and shuffled. The target creature will remain exiled. 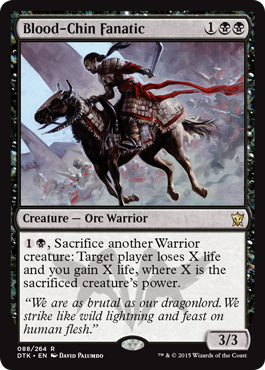 1B, Sacrifice another Warrior creature: Target player loses X life and you gain X life, where X is the sacrificed creature’s power. Use the creature’s power as it last existed on the battlefield, including any +1/+1 counters it had, when determining the value of X. Any creature on the battlefield can be the target of Boltwing Marauder’s triggered ability, including the one that entered the battlefield and caused the ability to trigger. For each creature target player controls, put a token onto the battlefield that’s a copy of that creature. The token creatures all enter the battlefield at the same time. A token that enters the battlefield as a copy of a face-down creature is a face-up colorless 2/2 creature with no name, abilities, or creature types. Each token copies exactly what was printed on the original creature and nothing else (unless that permanent is copying something else or is a token; see below). It doesn’t copy whether that creature is tapped or untapped, whether it has any counters on it or Auras and Equipment attached to it, or any non-copy effects that have changed its power, toughness, types, color, and so on. 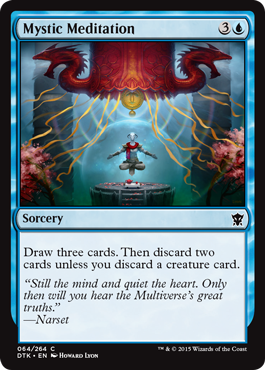 If the copied creature has X in its mana cost, X is considered to be zero. 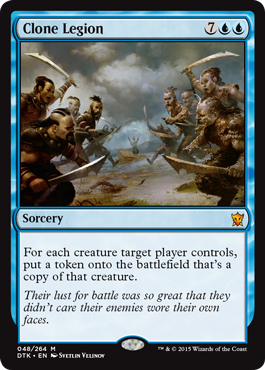 If the copied creature is copying something else, then the token enters the battlefield as whatever that creature copied. If the copied creature is a token, the token created by Clone Legion copies the original characteristics of that token as stated by the effect that put the token onto the battlefield. Any enters-the-battlefield abilities of the copied creature will trigger when the token enters the battlefield. Any “as [this permanent] enters the battlefield” or “[this permanent] enters the battlefield with” abilities of the copied creature will also work. Remember that if you control more than one legendary permanent with the same name, you’ll choose one to remain on the battlefield and put the rest into their owners’ graveyards. Playing a card this way follows the normal rules for playing the card. You must pay its costs, and you must follow all applicable timing rules. For example, if one of the cards is a creature card, you can cast that card only during your main phase while the stack is empty. 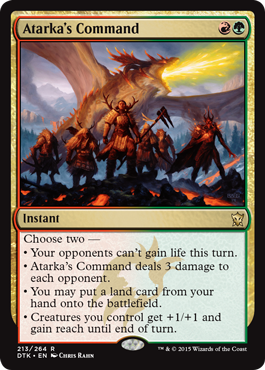 Under normal circumstances, you can play a land card exiled with Commune with Lava only if you haven’t played a land yet that turn. Any cards you don’t play will remain exiled. If the spell becomes an illegal target (because it’s left the stack, for example) when Contradict tries to resolve, Contradict will be countered and none of its effects will happen. You won’t draw a card. A spell that can’t be countered by spells and abilities is a legal target for Contradict. The spell won’t be countered when Contradict resolves, but you’ll draw a card. 1B, Exile one or more creature cards from your graveyard: Put an X/X black Zombie Horror creature token onto the battlefield tapped, where X is twice the number of cards exiled this way. Because exiling the creature cards from your graveyard is part of the activation cost, no player can respond to stop you from activating the ability by moving creature cards out of your graveyard. 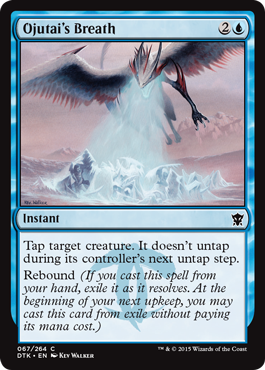 “Exiled this way” refers to that activation of the ability, not any creature cards that have been previously exiled. 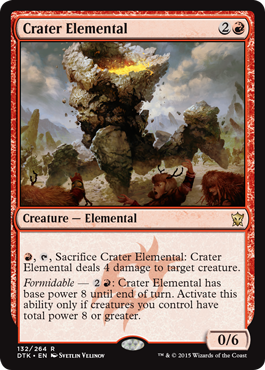 R, T, Sacrifice Crater Elemental: Crater Elemental deals 4 damage to target creature. Crater Elemental’s last ability overrides all previous effects that set its power to a specific value. Other effects that set its power to a specific value that start to apply after the ability resolves will override this effect. Effects that modify Crater Elemental’s power, such as the effects of Giant Growth or Hall of Triumph, will apply to it no matter when they started to take effect. The same is true for counters that change its power (such as +1/+1 counters) and effects that switch its power and toughness. 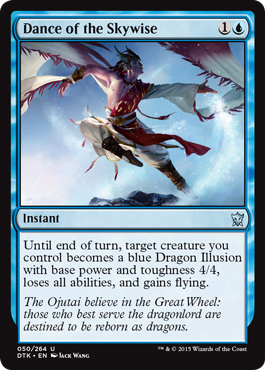 The target creature will lose all other colors and creature types and be blue, a Dragon, and an Illusion. It will retain any other types it may have had, such as artifact. The target creature will lose any abilities it may have gained prior to Dance of the Skywise resolving. Notably, if the creature is a face-down creature with morph or megamorph, you can’t turn it face up, as it wouldn’t have a morph or megamorph cost when face up (because it’s lost all abilities other than flying). After Dance of the Skywise resolves, the creature can gain abilities as normal. Dance of the Skywise overrides all previous effects that set the creature’s power or toughness to specific values. However, effects that set its power or toughness to specific values that start to apply after Dance of the Skywise resolves will override this effect. 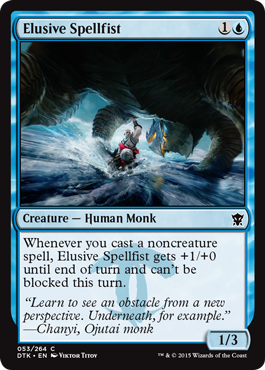 Effects that modify the power or toughness of the creature, such as the effects of Giant Growth or Hall of Triumph, will apply to it no matter when they started to take effect. The same is true for counters that change the creature’s power or toughness (such as +1/+1 counters) and effects that switch its power and toughness. If you cast a creature spell that enters the battlefield as a copy of Deathbringer Regent, the enters-the-battlefield ability will trigger (assuming the “five or more other creatures” requirement is also met). 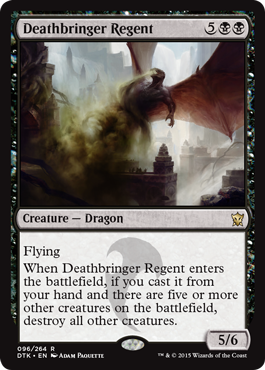 Deathbringer Regent’s last ability destroys all creatures except Deathbringer Regent, including the five other creatures required for the ability to have an effect. Deathmist Raptor’s second ability triggers only if Deathmist Raptor is in the graveyard when a permanent you control is turned face up. You choose whether Deathmist Raptor will enter the battlefield face up or face down as the ability resolves. You may also choose to leave it in the graveyard. Creatures with power less than Den Protector’s power can’t block it. You compare Den Protector’s power to the power of any creature trying to block it only as blockers are assigned. Once Den Protector has been legally blocked by a creature, changing the power of either creature won’t change or undo the block. 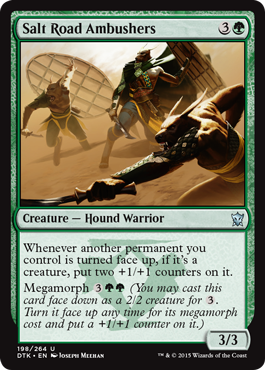 If an attacking face-down Dirgur Nemesis is turned face up, it will continue to be attacking even though it will have defender. Destroy target blue or black noncreature permanent. Permanents you control can’t be the targets of blue or black spells your opponents control this turn. If you choose the second mode, and if a permanent you control is being targeted by a spell when Display of Dominance resolves, nothing happens right away. When that spell would resolve, its color is checked. If it’s blue or black, that permanent will be an illegal target for that spell and won’t be affected by it. If all that spell’s targets have become illegal by the time it would resolve, it’s countered. 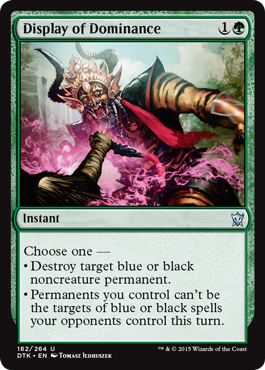 If you choose the second mode, no new blue or black spell may be cast by an opponent that turn targeting a permanent you control after Display of Dominance resolves. If you choose the second mode, Display of Dominance will affect any permanent you happen to control at any point during the rest of the turn, not just permanents you control as it resolves. That’s because it doesn’t grant an ability to those permanents; rather, it affects the game rules and states something that’s now true about those permanents. Keep in mind that an Aura spell targets the permanent it will enchant (but an Aura on the battlefield doesn’t target the permanent it’s attached to). Permanents you control may be the targets of abilities from blue or black sources controlled by your opponents. 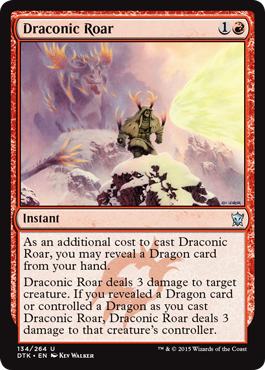 As an additional cost to cast Draconic Roar, you may reveal a Dragon card from your hand. Draconic Roar deals 3 damage to target creature. 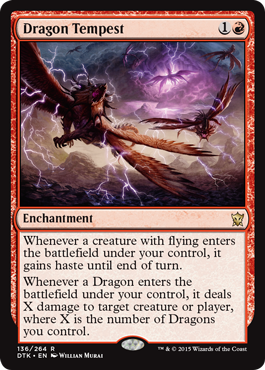 If you revealed a Dragon card or controlled a Dragon as you cast Draconic Roar, Draconic Roar deals 3 damage to that creature’s controller. Draconic Roar targets only the creature, not its controller. If that creature becomes an illegal target before Draconic Roar resolves, the spell is countered and none of its effects will occur. No damage is dealt. Use the number of Dragons you control as the last ability resolves to determine the value of X. The two abilities aren’t mutually exclusive. If a Dragon with flying (which is most of them) enters the battlefield under your control, both abilities will trigger. You choose how many targets the ability has and how the damage is divided as you put the ability on the stack. Each target must receive at least 1 damage. If some of the targets are illegal targets as the ability tries to resolve, the original division of damage still applies but no damage is dealt to the illegal targets. If all targets are illegal, the ability is countered. Casting a spell face down won’t cause Dragonlord Kolaghan’s last ability to trigger. A spell with no name can’t have the same name as any other card. If an opponent casts a creature spell with delve and exiles all cards from his or her graveyard with the same name to help pay its cost, Dragonlord Kolaghan’s ability won’t trigger. If Dragonlord Silumgar leaves the battlefield, you no longer control it, and its control-change effect ends. 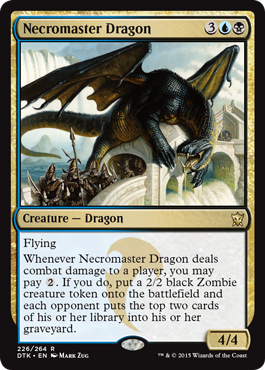 If Dragonlord Silumgar ceases to be under your control before its ability resolves, you won’t gain control of the creature or planeswalker at all. 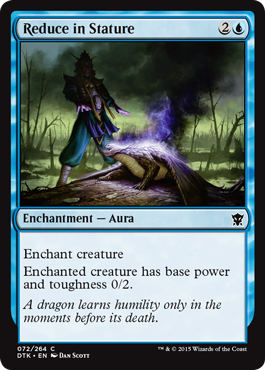 If another player gains control of Dragonlord Silumgar, its control-change effect ends. 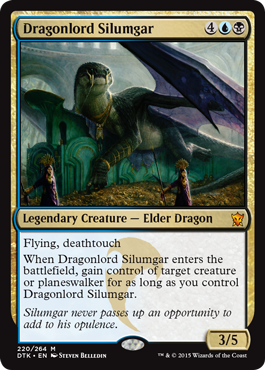 Regaining control of Dragonlord Silumgar won’t cause you to regain control of the creature or planeswalker. Dragonlord’s Servant can’t reduce the colored mana requirement of a Dragon spell you cast. If there are any additional costs to cast a Dragon spell, apply those before applying Dragonlord’s Servant and any other cost reductions. The ability can apply to alternative costs to cast a Dragon spell. Target creature you control fights target creature you don’t control. Although most instants and sorceries that cause damage to be dealt are the sources of that damage, a few cause other objects to deal damage (for example, spells that cause creatures to fight). The first ability of Dromoka’s Command won’t prevent damage caused by those other sources. You can target any player with the second ability, including one who doesn’t control an enchantment. Whenever you cast a noncreature spell, Elusive Spellfist gets +1/+0 until end of turn and can’t be blocked this turn. Once Elusive Spellfist has been blocked, causing its ability to trigger won’t change or undo that block. 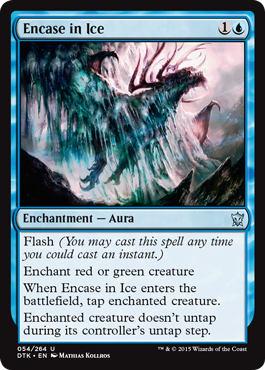 If the enchanted creature stops being red or green, or if it stops being a creature, Encase in Ice will be put into its owner’s graveyard. The creature can still be untapped by other spells and abilities. 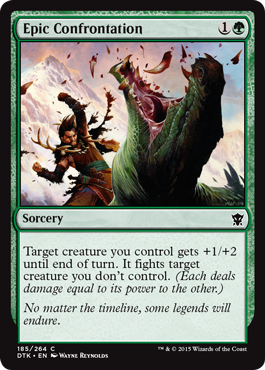 A creature entering the battlefield with one or more +1/+1 counters on it will cause Enduring Scalelord’s ability to trigger. 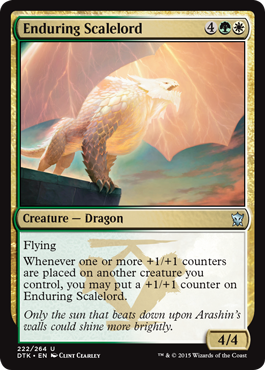 If +1/+1 counters are put on multiple creatures you control (other than Enduring Scalelord) at the same time, Enduring Scalelord’s ability will trigger once for each of those creatures. If you control two Enduring Scalelords, putting a +1/+1 counter on one of them will cause the ability of the other one to trigger. When this ability resolves, you’ll put a +1/+1 counter on the other Scalelord. This will cause the ability of the first one to trigger. This loop will repeat until you choose not to put a +1/+1 counter on one of the Enduring Scalelords. If the creature you control is an illegal target as Epic Confrontation tries to resolve, the creature you control won't get +1/+2. If that creature is a legal target but the creature you don’t control isn’t, your creature will still get +1/+2. In both cases, neither creature will deal or be dealt damage. 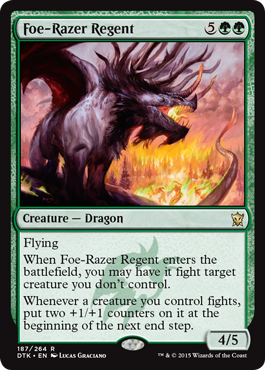 When Foe-Razer Regent enters the battlefield, you may have it fight target creature you don’t control. You choose the target of the first triggered ability as it goes on the stack, but you choose whether or not to fight as that ability resolves. 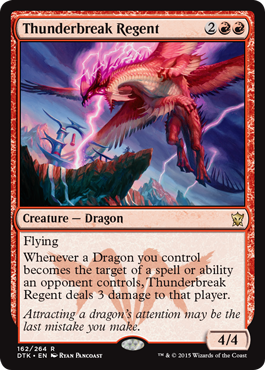 If the target creature you don’t control becomes an illegal target of the first triggered ability before it resolves, Foe-Razer Regent won’t fight and its last ability won’t trigger. If a creature you control fights during an end step, the delayed triggered ability that puts +1/+1 counters on that creature won’t trigger until the beginning of the following turn’s end step. You may cast Foul-Tongue Invocation targeting a player who controls no creatures. If you qualify for the “Dragon bonus,” you’ll just gain 4 life. Gate Smasher’s equip ability can target any creature. However, if that creature’s toughness is 3 or less as the equip ability resolves, Gate Smasher won’t become attached to it. 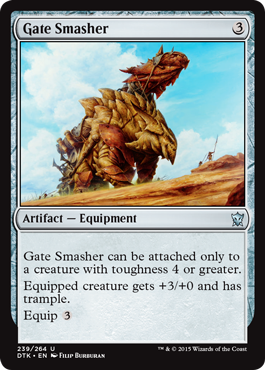 If Gate Smasher is attached to a creature whose toughness falls below 4, Gate Smasher will become unattached as a state-based action. If you cast Glaring Aegis, and the creature being targeted by the enchant creature ability becomes an illegal target before Glaring Aegis resolves, Glaring Aegis will be countered. It won’t enter the battlefield, and its triggered ability won’t trigger. 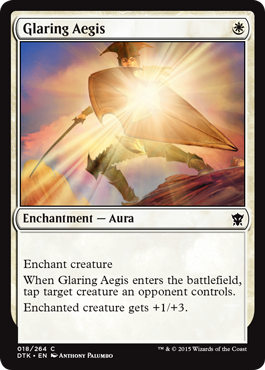 If no opponent controls a creature when Glaring Aegis enters the battlefield, the triggered ability will be removed from the stack and have no effect. You choose the order of the cards put on top of your library. You can cast Gravepurge with no targets. If you do, you’ll just draw a card. However, if you cast it with at least one target and all of those targets become illegal, the spell will be countered and you won’t draw a card. Gudul Lurker can’t be blocked. If a face-down Gudul Lurker attacks and is blocked, turning it face up won’t cause it to become unblocked. If Harbinger of the Hunt loses flying, its first activated ability will cause it to deal damage to itself. Whenever Hardened Berserker attacks, the next spell you cast this turn costs 1 less to cast. Hardened Berserker can’t reduce the colored mana requirement of a spell you cast. If there are any additional costs to cast a spell, apply those before applying Hardened Berserker and any other cost reductions. The ability can apply to alternative costs to cast a spell. 2, T, Sacrifice Haven of the Spirit Dragon: Return target Dragon creature card or Ugin planeswalker card from your graveyard to your hand. 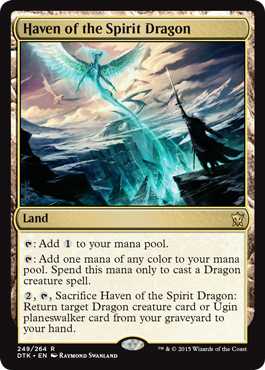 The mana produced by Haven of the Spirit Dragon’s second ability can be used to pay for any additional or alternative costs (such as dash costs) involved in casting a Dragon creature spell. When Hedonist’s Trove enters the battlefield, exile all cards from target opponent’s graveyard. You may play land cards exiled with Hedonist’s Trove. You may cast nonland cards exiled with Hedonist’s Trove. You can’t cast more than one spell this way each turn. The once-a-turn restriction of the last ability applies only to nonland cards. You can play a land card exiled with Hedonist’s Trove on the same turn you cast a nonland card exiled that way. 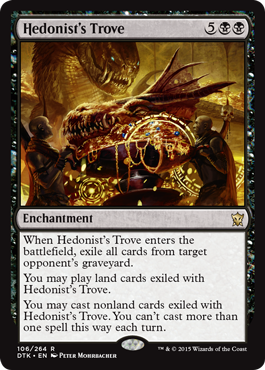 Under normal circumstances, you can play a land card exiled with Hedonist’s Trove only if you haven’t played a land yet that turn. If Hedonist’s Trove leaves the battlefield, any cards it exiled remain exiled. Those cards can no longer be played. Any future instance of Hedonist’s Trove (even one represented by the same card) will be a new object and won’t allow you to play those cards. If an attacking creature loses vigilance, it remains untapped and attacking. 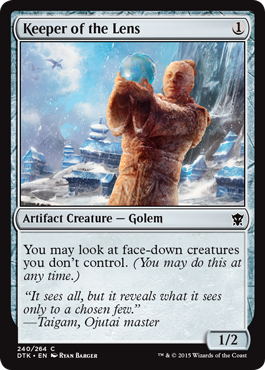 When Icefall Regent enters the battlefield, tap target creature an opponent controls. That creature doesn’t untap during its controller’s untap step for as long as you control Icefall Regent. Icefall Regent’s triggered ability can target any creature controlled by an opponent, including one that is already tapped. In that case, the creature stays tapped and won’t untap during its controller’s untap step. 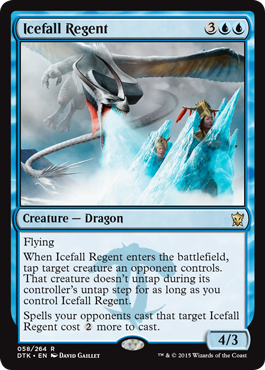 If another player gains control of Icefall Regent, the creature will no longer be affected by the ability stopping it from untapping, even if you later regain control of Icefall Regent. The ability stopping the creature from untapping will continue to apply to it even if the creature changes controllers. Icefall Regent’s last ability affects all spells cast by your opponents that target it, including Aura spells and spells with multiple targets. It doesn’t affect abilities. Whenever a creature enters the battlefield under an opponent’s control, attach Illusory Gains to that creature. Illusory Gains’s last ability is mandatory. You can’t choose to have Illusory Gains not move. 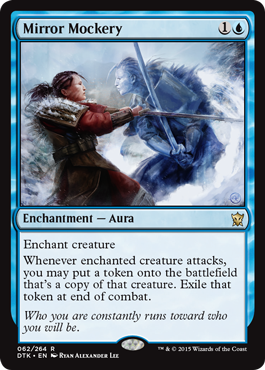 If Illusory Gains can’t legally enchant the creature that enters the battlefield (perhaps because it has protection from blue), it remains where it is. You retain control of the creature it’s currently enchanting. The last ability of Illusory Gains doesn’t target the new creature. It will become attached to that creature even if that creature has hexproof or shroud. 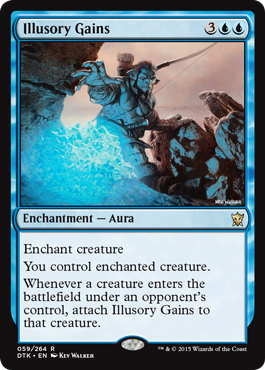 If multiple creatures enter the battlefield under an opponent’s control at the same time, Illusory Gains will trigger for each of them. You may put these abilities on the stack in any order. As each resolves, you’ll briefly gain control of the associated creature. The last one to resolve determines which one you’ll ultimately control. 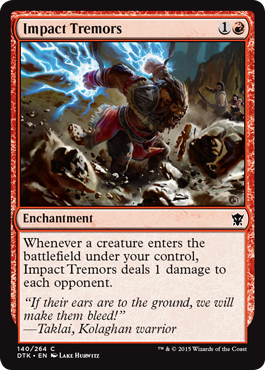 If multiple creatures enter the battlefield under your control at the same time, Impact Tremors will trigger that many times. Each of these separate abilities will deal 1 damage to each opponent. Once a creature gains indestructible, it will have it for the turn, even if it loses all its +1/+1 counters. 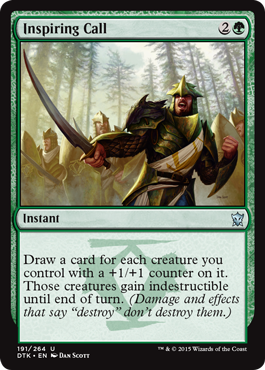 Creatures you control that have +1/+1 counters put on them after Inspiring Call resolves won’t gain indestructible. Ire Shaman can’t be blocked except by two or more creatures. If a face-down Ire Shaman attacks and is blocked by one creature, turning it face up won’t cause it to become unblocked. The card exiled with Ire Shaman’s last ability is exiled face up. Playing the card exiled with Ire Shaman’s last ability follows the normal rules for playing the card. You must pay its costs, and you must follow all applicable timing rules. For example, if the card is a creature card, you can cast that card only during your main phase while the stack is empty. Under normal circumstances, you can play a land card exiled with Ire Shaman only if you haven’t played a land yet that turn. If you don’t play the card, it will remain exiled. Keeper of the Lens allows you to look at face-down creatures you don’t control whenever you want to, even if you don’t have priority. This action doesn’t use the stack. Keeper of the Lens doesn’t stop your opponents from looking at face-down creatures they control. Keeper of the Lens doesn’t let you look at other players’ face-down spells while they’re on the stack. If Kolaghan Aspirant becomes blocked by multiple creatures, its ability will trigger once for each of them. The damage Kolaghan Aspirant deals because of its triggered ability isn’t combat damage. 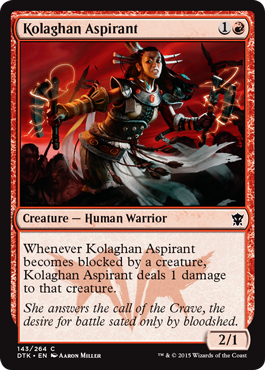 If that damage causes each creature blocking it to leave combat, Kolaghan Aspirant will remain blocked. It won’t be dealt combat damage in this case. 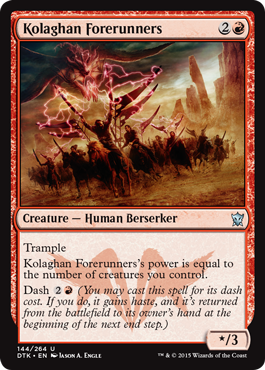 Kolaghan Forerunners’s power is equal to the number of creatures you control. The ability that defines Kolaghan Forerunners’s power functions in all zones, not just the battlefield. If Kolaghan Forerunners is on the battlefield, its ability will count itself. If the player’s graveyard is empty, the player will shuffle his or her library, then you’ll draw a card. 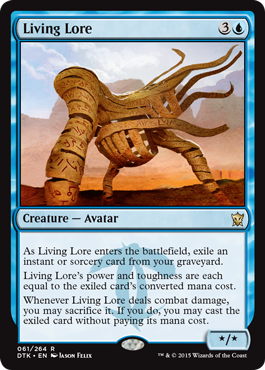 Living Lore’s power and toughness are each equal to the exiled card’s converted mana cost. If there are no instant or sorcery cards in your graveyard as Living Lore enters the battlefield, it will enter the battlefield as a 0/0 creature and be put into its owner’s graveyard due to having 0 toughness. 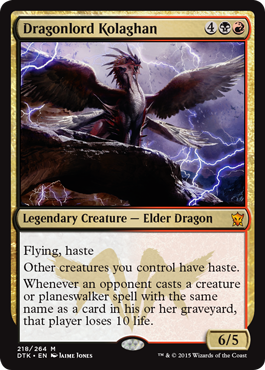 Similarly, if the exiled card somehow leaves exile while Living Lore is on the battlefield, Living Lore will become a 0/0 creature and be put into its owner’s graveyard (unless something else is raising its toughness). When casting a card with Living Lore’s last ability, ignore timing restrictions based on the card’s type. Other timing restrictions, such as “Cast [this spell] only during combat,” must be followed. If you cast a card “without paying its mana cost,” you can’t pay alternative costs. You can pay additional costs. If the card has mandatory additional costs, you must pay those. If you choose to cast the exiled card and it has X in its mana cost, you must choose 0 as its value. Gain control of target creature until end of turn. Untap that creature. It gains haste until end of turn and can’t be blocked this turn except by two or more creatures. Lose Calm can target any creature, including one that’s untapped or one you already control. Formidable — 2G: Target creature blocks Lurking Arynx this turn if able. Activate this ability only if creatures you control have total power 8 or greater. You may activate Lurking Arynx’s ability multiple times in a turn to force multiple creatures to block it if able. Activating Lurking Arynx’s ability doesn’t force you to attack with it that turn. If it doesn’t attack, the creatures affected by its ability can block other attacking creatures or not block at all. If a creature affected by Lurking Arynx’s ability can’t legally block it (perhaps because Lurking Arynx has gained flying), that creature can block other attacking creatures or not block at all. If, during the declare blockers step, a creature is tapped or is affected by a spell or ability that says it can’t block, it doesn’t block. If there’s a cost associated with having a creature block, its controller isn’t forced to pay that cost, so it doesn’t have to block in that case either. Creatures without flying can’t block this turn. 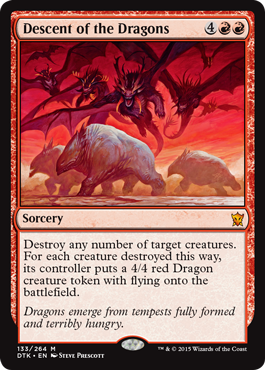 No creature without flying will be able to block that turn, including creatures that lose flying after Magmatic Chasm resolves and creatures without flying that enter the battlefield after Magmatic Chasm resolves. Whenever enchanted creature attacks, you may put a token onto the battlefield that’s a copy of that creature. 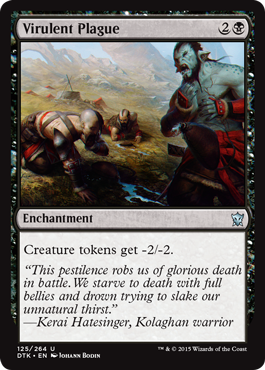 Exile that token at end of combat. Notably, the token won’t be attacking. If Mirror Mockery enchants a creature you don’t control, and you are the defending player, you can block with the token. The ability that exiles the token will trigger at end of combat no matter what happens to the original creature or to Mirror Mockery. If Mirror Mockery is no longer on the battlefield as its triggered ability resolves, its ability makes a copy of the creature it was enchanting when it left the battlefield. If it left the battlefield because it was no longer enchanting a legal creature, it makes a copy of the creature it was most recently enchanting before it left the battlefield. If Mirror Mockery’s ability creates multiple tokens (due to an effect such as the one Doubling Season creates), all such tokens will be exiled by the delayed triggered ability. The token copies exactly what was printed on the original creature and nothing else (unless that permanent is copying something else or is a token; see below). It doesn’t copy whether that creature is tapped or untapped, whether it has any counters on it or Auras and Equipment attached to it, or any non-copy effects that have changed its power, toughness, types, color, and so on. If the copied creature is a token, the token created by Mirror Mockery copies the original characteristics of that token as stated by the effect that put the token onto the battlefield. Draw three cards. Then discard two cards unless you discard a creature card. You may choose to discard a creature card and another card if you want to. Myth Realized can’t attack the turn it enters the battlefield. 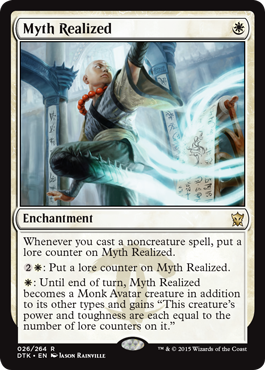 Activating the ability that turns Myth Realized into a creature while it’s already a creature will override any effects that set its power or toughness to a specific value. Effects that modify power or toughness without directly setting them to a specific value will continue to apply. +1: Look at the top card of your library. If it’s a noncreature, nonland card, you may reveal it and put it into your hand. −2: When you cast your next instant or sorcery spell from your hand this turn, it gains rebound. 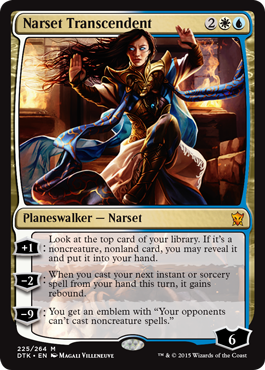 When resolving Narset’s first ability, if the top card of your library is a creature or a land card, or if you don’t wish to put it into your hand, it isn’t revealed. If a spell that exiles itself as part of its own resolution, such as Volcanic Vision, gains rebound, the ability that lets you cast the spell again won’t be created. The spell will simply be exiled. Necromaster Dragon’s last ability will trigger once for each player it deals combat damage to. For each of these abilities, you may pay 2 only once. Face-down creature spells you cast cost 1 less to cast. Obscuring Æther has no effect on spells that instruct you to manifest cards. 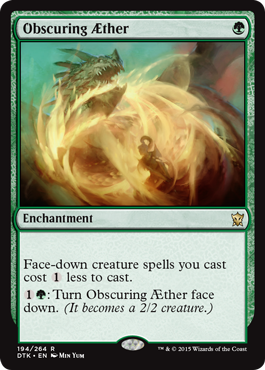 Note that Obscuring Æther doesn’t have a morph cost. Once it’s turned face down, it doesn’t have a way to turn itself face up. Ojutai Exemplars gains first strike and lifelink until end of turn. Exile Ojutai Exemplars, then return it to the battlefield tapped under its owner’s control. 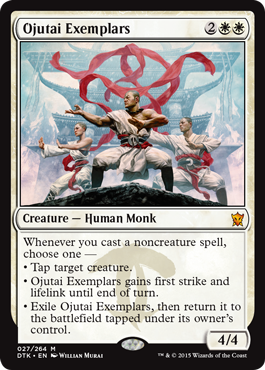 If Ojutai Exemplars leaves the battlefield in response to its ability with the third mode chosen, that ability won’t return Ojutai Exemplars to the battlefield. It will stay wherever it is. After the ability returns Ojutai Exemplars to the battlefield, it will be a new object with no connection to the Ojutai Exemplars that left the battlefield. It won’t be in combat or have any additional abilities it may have had when it left the battlefield. Any +1/+1 counters on it or Auras attached to it are removed. Tap target creature. It doesn’t untap during its controller’s next untap step. Ojutai’s Breath can target a creature that’s already tapped. It still won’t untap during its controller’s next untap step. Ojutai’s Breath tracks the creature, but not its controller. If the creature changes controllers before its first controller’s next untap step has come around, then it won’t untap during its new controller’s next untap step. You must choose a creature with flying in order to cast Pinion Feast. You can’t cast it without a legal target just to bolster. If you cast Press the Advantage with two targets, and only one of them is still a legal target as Press the Advantage resolves, that target will get +2/+2 and gain trample. Press the Advantage will have no effect on the illegal target. 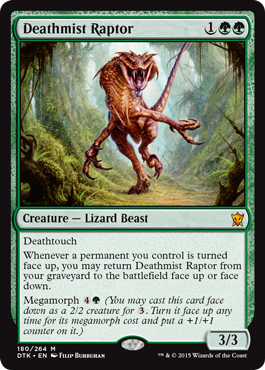 When Profaner of the Dead exploits a creature, return to their owners’ hands all creatures your opponents control with toughness less than the exploited creature’s toughness. Use the toughness of the exploited creature as it last existed on the battlefield to determine which creatures to return to their owners’ hands. Qal Sisma Behemoth can’t attack or block unless you pay 2. If an effect says that Qal Sisma Behemoth must attack or block if able, you can choose not to pay the associated cost and ignore that requirement. Players are never forced to pay a cost to attack or block. The mana produced by Qarsi Deceiver can’t be used to cast a spell that instructs you to manifest cards. Reduce in Stature overrides all previous effects that set the creature’s power or toughness to specific values. However, effects that set its power or toughness to specific values that start to apply after Reduce in Stature becomes attached to the creature will override this effect. Effects that modify the power or toughness of the creature, such as the effects of Giant Growth or Honor of the Pure, will apply to it no matter when they started to take effect. 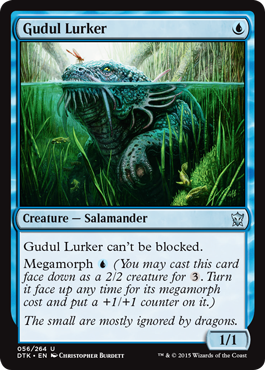 The same is true for counters that change the creature’s power or toughness (such as +1/+1 counters) and effects that switch its power and toughness. Prevent all combat damage that would be dealt this turn. You may look at each face-down creature that’s attacking or blocking. You can cast Revealing Wind even if there are no face-down creatures attacking or blocking. The damage-prevention effect will still apply. 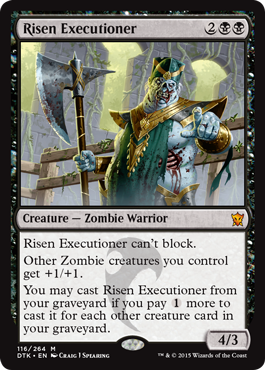 You may cast Risen Executioner from your graveyard if you pay 1 more to cast it for each other creature card in your graveyard. Risen Executioner’s last ability doesn’t change when you can cast it. Once you start to cast Risen Executioner from your graveyard, you’ll finish casting it, including paying its cost, before any player receives priority. No one can respond in time to affect the cost you’ll pay (perhaps by destroying one of your other creatures). Whenever you sacrifice a creature, target opponent sacrifices a creature. Ruthless Deathfang’s triggered ability will trigger whenever you sacrifice any creature, including Ruthless Deathfang itself. It will trigger whenever you sacrifice a creature for any reason, including to pay a cost or as the result of a spell or ability (such as an opposing Ruthless Deathfang’s ability). Notably, the “legend rule” does not cause any permanents to be sacrificed. They are simply put into their owners’ graveyards. Whenever another permanent you control is turned face up, if it’s a creature, put two +1/+1 counters on it. The face-down permanent must be a creature both before it’s turned face up and when the triggered ability resolves to have +1/+1 counters placed on it. 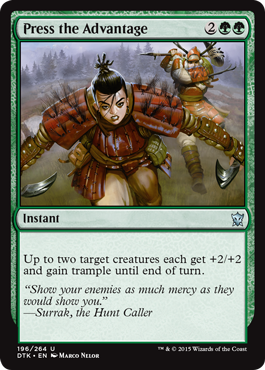 Sarkhan’s Rage deals 5 damage to target creature or player. If you control no Dragons, Sarkhan’s Rage deals 2 damage to you. 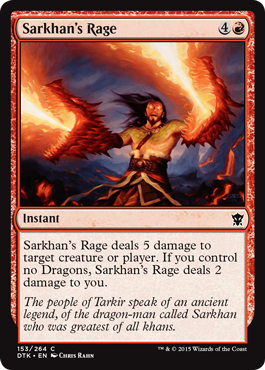 Sarkhan’s Rage checks whether you control a Dragon as it resolves. Whenever Savage Ventmaw attacks, add RRRGGG to your mana pool. Until end of turn, this mana doesn’t empty from your mana pool as steps and phases end. 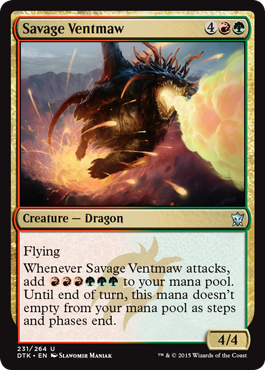 This mana won’t empty from your mana pool as steps and phases end for the remainder of the turn even if Savage Ventmaw leaves the battlefield during the turn. 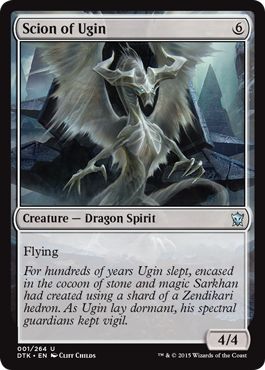 Scion of Ugin is colorless. It isn’t monocolored, nor is it an artifact. Formidable — 9GG, T: Each player’s life total becomes the number of creatures he or she controls. Activate this ability only if creatures you control have total power 8 or greater. The first ability of Shaman of Forgotten Ways is a mana ability. It doesn’t use the stack and can’t be responded to. 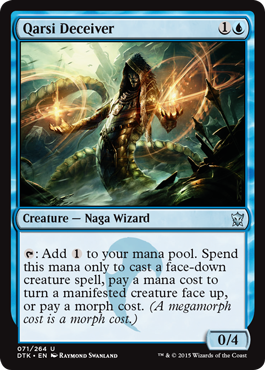 The mana produced by Shaman of Forgotten Ways can be used to cast face-down creature spells with morph or megamorph. Count the number of creatures each player controls when the last ability resolves to determine what number each player’s life total will become. For a player’s life total to become a specific number, the player gains or loses the appropriate amount of life. For example, if a player’s life total is 12 and that player controls three creatures as the ability resolves, he or she will lose 9 life. Other effects that interact with lifegain or loss will interact with this effect accordingly. If a player controls no creatures as the last ability resolves, his or her life total will become 0, causing that player to lose the game. If all players’ life totals become 0 this way, the game will be a draw. 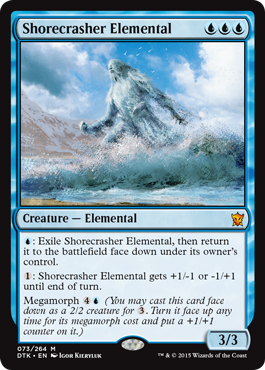 U: Exile Shorecrasher Elemental, then return it to the battlefield face down under its owner’s control. 1: Shorecrasher Elemental gets +1/-1 or -1/+1 until end of turn. After Shorecrasher Elemental’s first ability returns it to the battlefield, it will be a new object with no connection to the Shorecrasher Elemental that left the battlefield. It won’t be in combat or have any additional abilities it may have had when it left the battlefield. Any +1/+1 counters on it or Auras attached to it are removed. You choose whether Shorecrasher Elemental gets +1/-1 or -1/+1 as the last activated ability resolves. Face-down creatures have a converted mana cost of 0. If one is exiled by Silkwrap, it will return to the battlefield face up. Silkwrap’s ability causes a zone change with a duration, a style of ability that’s somewhat reminiscent of older cards like Oblivion Ring. However, unlike Oblivion Ring, cards like Silkwrap have a single ability that creates two one-shot effects: one that exiles the creature when the ability resolves, and another that returns the exiled card to the battlefield immediately after Silkwrap leaves the battlefield. If Silkwrap leaves the battlefield before its triggered ability resolves, the target creature won’t be exiled. The exiled card returns to the battlefield immediately after Silkwrap leaves the battlefield. Nothing happens between the two events, including state-based actions. In a multiplayer game, if Silkwrap’s owner leaves the game, the exiled card will return to the battlefield. Because the one-shot effect that returns the card isn’t an ability that goes on the stack, it won’t cease to exist along with the leaving player’s spells and abilities on the stack. Creatures with power greater than Silumgar Assassin’s power can’t block it. 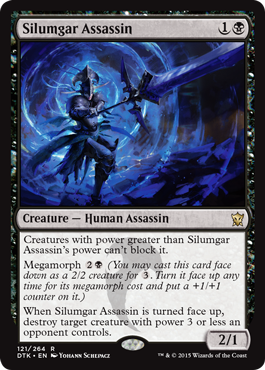 When Silumgar Assassin is turned face up, destroy target creature with power 3 or less an opponent controls. The powers of Silumgar Assassin and the creature trying to block it are checked only as blockers are declared. Changing the powers of either of those creatures after Silumgar Assassin is legally blocked won’t change or undo the block. Whenever you cast a noncreature spell, you may pay 1U. 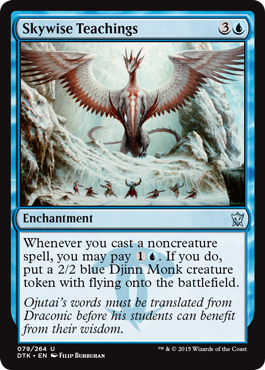 If you do, put a 2/2 blue Djinn Monk creature token with flying onto the battlefield. The ability will trigger only once for each noncreature spell you cast. You can pay 1U only once and create one Djinn Monk. Sprinting Warbrute attacks each turn if able. You still choose which player or planeswalker Sprinting Warbrute attacks. If, during your declare attackers step, Sprinting Warbrute is tapped, is affected by a spell or ability that says it can’t attack, or hasn’t been under your control continuously since the turn began (and doesn’t have haste), then it doesn’t attack. If there’s a cost associated with having a creature attack, you’re not forced to pay that cost, so it doesn’t have to attack in that case either. 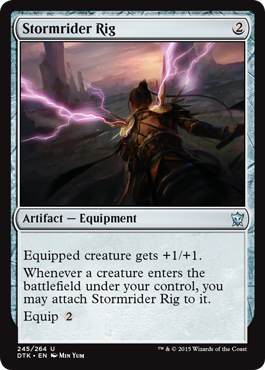 Whenever a creature enters the battlefield under your control, you may attach Stormrider Rig to it. If the creature that entered the battlefield is no longer on the battlefield as Stormrider Rig’s second ability resolves, Stormrider Rig doesn’t move. This is also true if that creature can’t legally be equipped by Stormrider Rig. Count the number of cards in your hand as Sunbringer’s Touch resolves to determine the value of X. Destroy target black or red creature that’s attacking or blocking. You gain 2 life. If Surge of Righteousness resolves but the creature isn’t destroyed (perhaps because it regenerated or it has indestructible), you’ll still gain 2 life. However, if the creature becomes an illegal target before Surge of Righteousness resolves, it will be countered and none of its effects will happen. You won’t gain life. You can’t put creatures onto the battlefield face down this way. The creature you put onto the battlefield will be returned to your hand only if it’s still on the battlefield as the delayed triggered ability resolves during the next end step. If it leaves the battlefield before then, it will remain wherever it is. 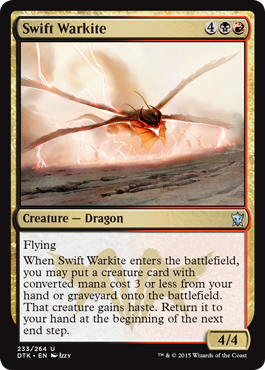 The delayed triggered ability that returns the creature to your hand will trigger even if Swift Warkite leaves the battlefield before the next end step. Target creature you control deals damage equal to its power to target creature you don’t control. 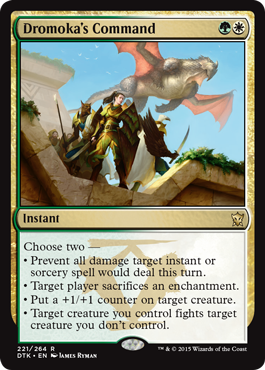 If either creature is an illegal target as Tail Slash tries to resolve, the creature you control won’t deal damage. Thunderbreak Regent’s ability will resolve before the spell or ability that caused it to trigger. 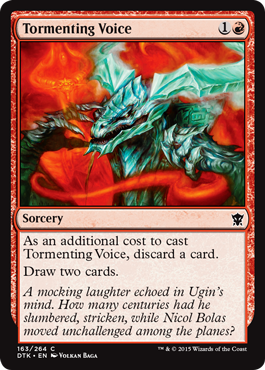 Because discarding a card is an additional cost, you can’t cast Tormenting Voice if you have no other cards in hand. 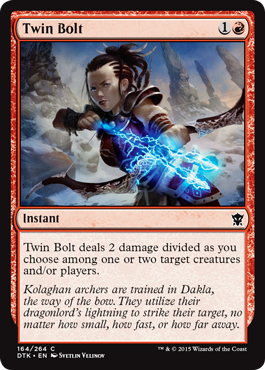 Twin Bolt deals 2 damage divided as you choose among one or two target creatures and/or players. You choose whether Twin Bolt has one target that will be dealt 2 damage or two targets that will each be dealt 1 damage as you cast Twin Bolt. If you cast Twin Bolt with two targets and one of those targets becomes illegal before Twin Bolt resolves, the remaining legal target will be dealt 1 damage. You can’t change the original division of damage. A monocolored creature has exactly one color. Face-down creatures and most artifact creatures are not monocolored. If an effect creates a creature token that normally has toughness 2 or less, it will enter the battlefield with toughness 0 or less, be put into its owner’s graveyard, and then cease to exist. Any abilities that trigger when a creature enters the battlefield or dies will trigger. Attacking creatures get +2/+0 and gain trample until end of turn. An “attacking creature” is one that has been declared as an attacker that combat, or one that was put onto the battlefield attacking this combat. 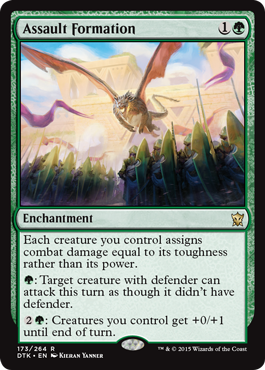 Unless that creature leaves combat, it continues to be an attacking creature through the end of combat step, even if the player it was attacking has left the game, or the planeswalker it was attacking has left the battlefield. 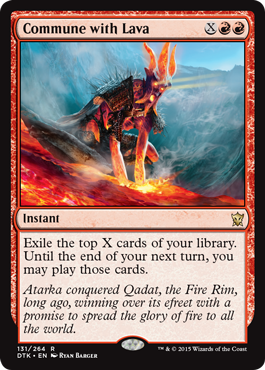 Even though Volcanic Rush affects only attacking creatures, the bonus will remain for the rest of the turn. Only creatures that are attacking as Volcanic Rush resolves will receive the bonus. In other words, casting it before you declare attackers usually won’t do anything. Return target instant or sorcery card from your graveyard to your hand. 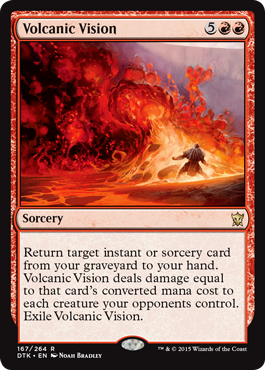 Volcanic Vision deals damage equal to that card’s converted mana cost to each creature your opponents control. Exile Volcanic Vision. If the target instant or sorcery card becomes an illegal target before Volcanic Vision resolves, the spell will be countered and none of its effects will happen. No damage will be dealt and Volcanic Vision won’t be exiled. If the target has X in its mana cost, X is 0. If the target is a split card, damage will be dealt only once to each creature your opponents control. The damage will be equal to the sum of the card’s two converted mana costs. Dash costs you pay cost 2 less (as long as this creature is on the battlefield). Warbringer’s first ability doesn’t affect Warbringer itself. Warbringer’s first ability can’t affect the colored mana requirement of a dash cost. If a card’s dash cost includes one generic mana, that cost will be reduced by 1. Zurgo Bellstriker can’t block creatures with power 2 or greater. 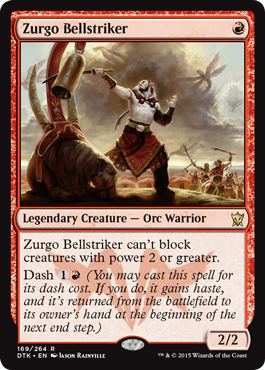 Once Zurgo Bellstriker has legally blocked a creature, raising that creature’s power to 2 or greater won’t undo the block. Magic: The Gathering, Magic, Dragons of Tarkir, Fate Reforged, Khans of Tarkir, Theros, Born of the Gods, and Journey into Nyx are trademarks of Wizards of the Coast LLC in the USA and other countries. ©2015 Wizards.